I recommend that, before you listen to "Corduroy" (Little Sky Records), the 3rd CD from guitarist/composer David Ullmann, you go to his website - davidullmann.com/video/ - and check out the video in which and members of his David Ullmann 8 speak about the making of the CD. You'll meet drummer Vinnie Sperrazza, vibraphonist Chris Dingman (both of whom played on his previous album "Falling") plus saxophonist Loren Stillman, clarinetist Mike McGinnis, and cornetist Kirk Knuffke (trombonist Brian Drye and bassist Gary Wang - who also played on "Falling" - round out the octet.) And, you will meet Mr. Ullmann who smiles a lot while talking about his band. That genial attitude permeates the music on "Corduroy", songs which the composer says were influenced by TV show theme songs from the 1970s (such as "M.A.S.H." and "Taxi"). This music is filled with singable melodies; just try to listen to the title track without wanting to hum along. Sperrazza's fine cymbal work lights up the proceedings on "Ocelot", especially during the fine solos by Drye and McGinnis (both of whom play in The 4 Bags) - the "bang" of the snare drum also stands out when it leads the charge into Knuffke's solo. There's just a hint of Steely Dan in the opening section of "Something You Said" and wonderful West Coast bop turn on "Papaya." Both tracks feature exemplary guitar playing, the former for its quietly rippling single-note runs while Ullmann's rhythm playing shines on the latter (Dingman's vibes solo really impresses as does Stillman's strong alto work and, of course, Knuffke contributes another fine solo.) The soulful ballad "You Can't Go Back" is a well-constructed composition, with a sweet melody, fine harmonies and short solos from the leader, Knuffke and Wang. Still, it's the emotional quality of the song that will resonate long after you finish listening. The closing track, the aptly titled "Moving On", is also a strong ballad. 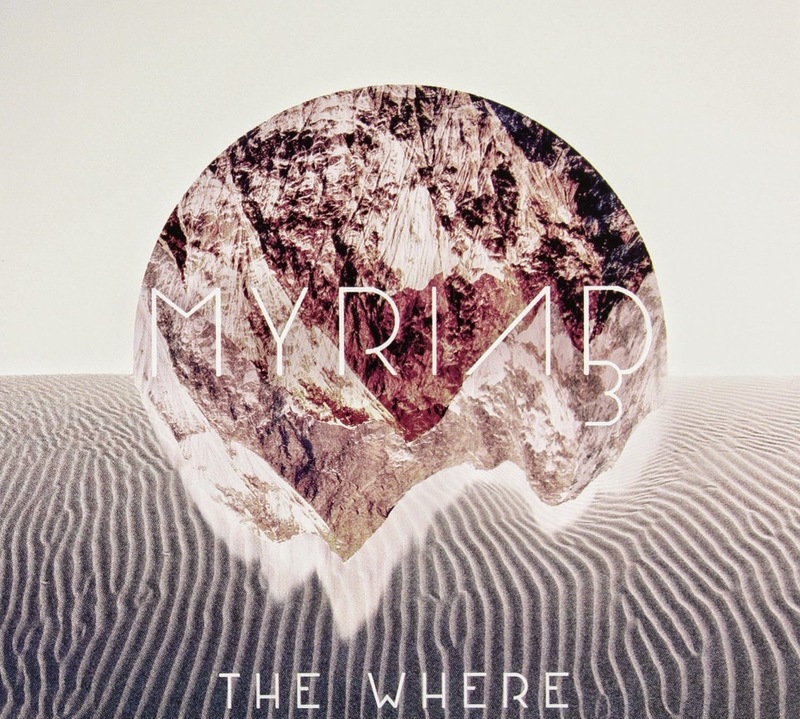 The piece seems influenced by Wayne Horvitz, especially the voicings of the reeds and brass. The melody moves around the front line before Drye and Stillman play solo lines that weave around each other. Following that, the guitar, bass clarinet and cornet follow the same format until their lines merge and the opening melody returns. It's one of the prettiest pieces you'll hear this year (and, perhaps, for a long time to come). "Corduroy" is comfortable music, great to get lost in (the passionate playing of Vinnie Sperrazza immediately catches your ear with the melodies a close second). Every musician in the David Ullmann 8 is involved in the success of this music. The music seems to float effortlessly from the speakers, with the perfect balance of fire and calm, solos and ensemble playing. One can understand why David Ullmann smiles so much in the video - you will as well. For more information, go to davidullmann.com. Pianist Joel Forrester and soprano saxophonist Phillip Johnston started The Microscopic Septet in 1980 as a vehicle for a saxophone quartet with rhythm section. For 13 years (through 1992), they toured and recorded, playing the often quirky tunes of its founders, songs that sound as if there was a juke joint in New York City where the proprietor locked Duke Ellington, Sun Ra, "Fats" Waller and Julius Hemphill into a room and they came with a splendid hybrid. The band's hiatus ended in 2006 and "Manhattan Moonrise" (Cuneiform Records) is the 3rd installment in their comeback. Amazingly, there have only been 2 changes in membership since the band started; Forrester and Johnston recruited the rhythm section of Dave Hofstra (bass) and Richard Dworkin (drums) as well as baritone saxophonist Dave Sewelson with alto saxophonist Don Davis replacing John Zorn (really) in 1981 and tenor saxophonist Mike Hashim joining when the band reformed 8 years ago. As for the music, there's plenty of variety in the 12 song, 61 minute program. Johnston's sprightly "When You Get in Over Your Head" starts the program with the composer's shifting tempos and stop-on-a-dime changes. He also contributed the super funky "Obeying the Chemicals" that sounds like tune from The Band with an Allan Toussaint horn arrangement with an Albert Ammons-flavored piano solo. The subject is swing on Johnston's "Let's Coolerate One", a jumping jive with a hearty walking bass underneath a fine baritone sax solo followed by a boppish tenor spotlight and a sweet piano solo. His final contribution is "You Got That Right! ", a "jump blues" powered by splashing cymbals and thick toned bass lines. The other 8 compositions belong to Forrester; they range from the subtle "pop" sounds of "No Time" to the bouncing title track, with sections influenced by Thelonious Monk and Artie Shaw. Much more Monk in the slow blues of "A Snapshot Of the Soul" but the horn lines favor Coleman Hawkins. More blues, this time with an Ellingtonian feel, on "Star Turn" while there's a touch of gospel and r'n'b in the bouncy "Hang It On a Line" (the playful melody line and accompanying harmonies are mighty attractive as well.) Dworkin's fat-back drums and Hofstra's buoyant bass lines keep the piece jumping. Smart bow to "Hey Joe" during the baritone solo. The lovely unaccompanied piano solo at the onset of "Blue" does not prepare one for the musical chaos that follows, although the band does teeter on the brink of sanity every now and then. Is that a hint of Bach or Rachmaninoff in the melody line before the band breaks into a New Orleans groove on the final track, "Occupy Your Life"? Whatever it is, the tune has a snaky groove that dances beneath the solos. The composer delivers a heartfelt vocal near the close of the tune, reminding the listener to take control of their destiny. Thee is something about the gentle anarchy of The Microscopic Septet that does good for one's soul. The band can swing, rock, glide, bounce and keep you guessing from one minute to the next. 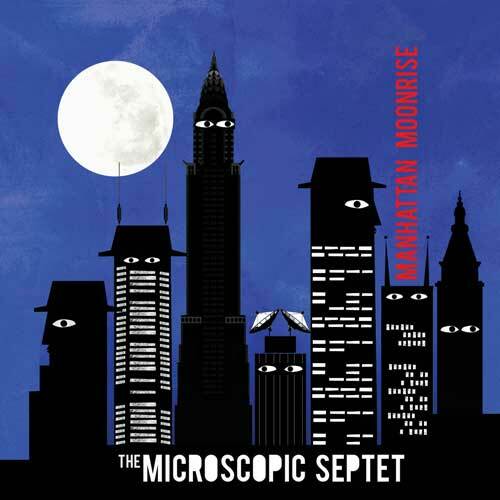 Their brand of musical joy never sounds stale - "Manhattan Moonrise" is good music that sounds better with each successive listen. For more information, go to www.microscopicseptet.com. Russian-born and Brooklyn-raised, guitarist/composer Gene Segal studied music at William Paterson University in New Jersey, studying with guitarists Vic Juris, Gene Bertocini and Paul Murphy. He also studied composition with Richard DeRosa. In 2009, he issued his debut CD, "Hypnotic" (Innova) featuring the fine work of organist Sam Barsh and drummer Matt Kane (plus a 3-piece horn section). 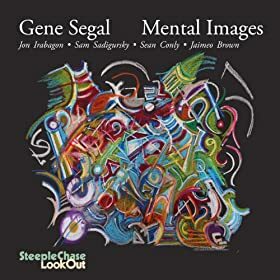 His 2nd disk, "Mental Images", finds the guitarist on the SteepleChase/LookOut label with another excellent band, this time featuring the front line of Jon Irabagon (alto saxophone) and Sam Sadigursky (tenor sax, clarinet) plus the fiery rhythm section of Sean Conly (bass) and Jaimeo Brown (drums). "Healing Feeling." The deep groove (replete with "wah-wah" guitar comping) supports Irabagon's blazing solo. The leader steps out for his own "fuzzed-up" statement while Sadigursky (on tenor) draws down the intensity level at the start of his solo only to build it back up (with the drummer mightily pushing him on.) The proceedings take a turn for the Platonic on "Allegory of the Cave", a ballad with an Eastern European feel (and the occasional waltz tempo). Sadigursky's woody bass clarinet tones move the band into "Minds Eye", a ballad with great intensity. The clarinet solo twists and turns on the power of Brown's rapid-fire drumming and then joins with the bass and guitar to support a strong drum spotlight. There's a playful and "free" feel to "Irrational Drives" as well as another intense alto solo while "The Bearded Lady" feels a flowing soprano sax solo from Sadigursky and more powerful drumming. Perhaps my favorite track is the mysterious "Trapeze Act", with its "film noir" feel and splendid clarinet work. In fact, Sadigursky dominates the first 2/3rds of the piece yet Segal's "rock-ish" solo stands out as well. By the time you reach the "avant-blues" of the last track "Elephants", you realize that no 2 tracks sound the same and that Jaimeo Brown can be a game changer with his powerful drum work. Gene Segal is no slouch on his instrument not only when he is guiding the band through the pieces with his strong chordal support but also when he takes the spotlight. His background work often suggests the influences of both Bill Frisell and former teacher John Abercrombie but Segal is very much his own man. "Hypnotic" was quite good but "Mental Images" is a giant step forward. For more information, go to www.genesegal.com. 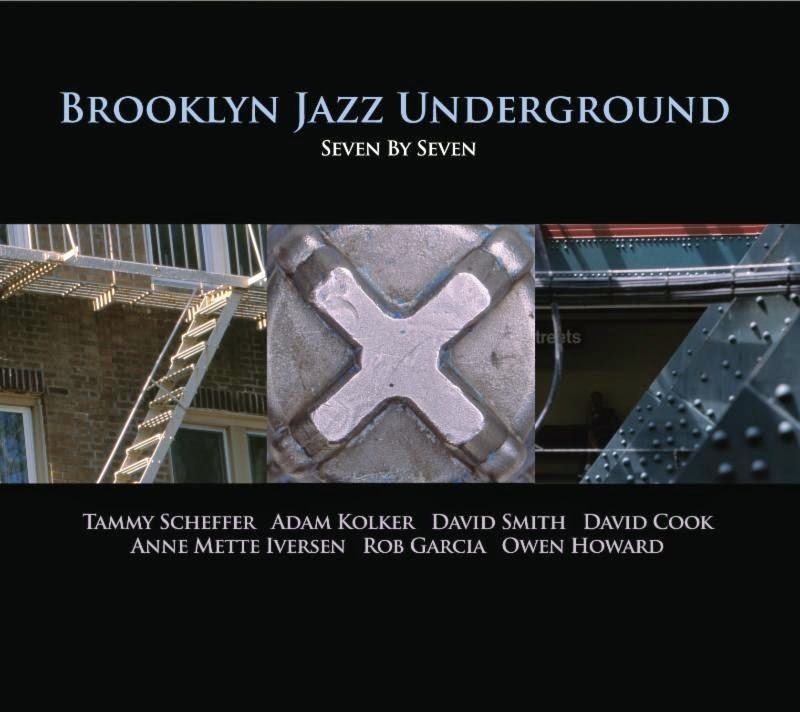 For its 2012 debut "A Portrait of Brooklyn" (BJU Records - reviewed here), the Brooklyn Jazz Underground was a quintet consisting of Anne Mette Iversen (bass), Rob Garcia (drums), Adam Kolker (saxophones, clarinets), Dan Pratt (saxophone, clarinet, flute) and David Smith (trumpet). The 2014 version that is featured on the ensemble's second BJU CD, "Seven By Seven", has expanded to a septet. Pratt is gone but, in his stead, the group now includes David Cook (piano), Owen Howard (drums) and Tammy Scheffer (vocals). The new recording includes 14 songs, 2 by each participant. The twist here is that each composer picked a name out of a hat with the task of creating a "shorty" (a new piece not to exceed 2:25 based on a fragment of one of their compatriots' compositions.) Fun for the band and a novel way to create new repertoire (to build from) plus it creates quite a challenge for the avid listener. Yet, you need not play a guessing game to enjoy the music here. Among the longer pieces, Ms. Scheffer's "Our Last Hora" blends Middle-Eastern rhythms with Western harmonies over a fine melody line. The composer's wordless vocals here (and throughout the program) blend well with the other instruments. That is quite nicely done on Ms. Mette Iversen's "Along The Lines" where Ms. Scheffer blends with the bass clarinet and trumpet to present the melody. There is tension created by the 2 drummers beneath the sparkling piano solo, as if they want everyone to speed up. Which is what happens - the speeding up - in the middle section where Kolker (tenor saxophone) and Smith trade solo lines. Howard's "Cowboys and Indians" is the longest track (10:38), with an opening reminiscent of Shelley Manne's drumming on Sonny Rollins' "I'm An Old Cowhand" (from the 1957 "Way Out West" Lp). Here, the percussion struts more than lopes as the front line twirls through the melody. Everyone stops for the bass solo and, at its conclusion, the band returns at a slower, more hypnotic pace, for Kolker's mesmerizing clarinet solo. Other highlights include pianist Cook's "Fort Pierce", a performance that opens as a ballad but takes a sharp turn into Kolker's solo soprano sax flight over the rampaging drums. Garcia's "Y" opens as a duet for voice and trumpet then presents the theme in waltz tempo before speeding up the tempo, changing the time for Cook's piano solo, playing with tempo changes for Kolker's breathy tenor spotlight before the drum solo. Immediately following is Kolker's "shorty"; titled "This Is Why", one might surmise the song and title refer to Garcia's composition but not to these ears. It's a sweet ballad for piano and the composer's clarinet, bringing the program to a gentle close. "Seven By Seven", like its predecessor, is a delightful musical journey. Intelligent, exciting, very well-played (Ms. Iversen, in particular, sounds energized throughout. 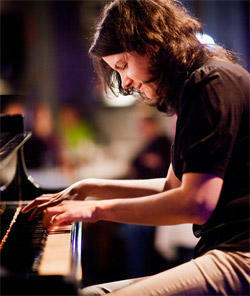 ), the 7 members of the Brooklyn Jazz Underground display great creativity while they are having great fun. For more information, go to www.brooklynjazz.org/index.php. If you are in the New York City area on Tuesday August 12, Smalls Jazz Club (183 West 10th Street) presents the David Smith Quintet (7:30 p.m.), the Anne Mette Iversen Quartet (8:35), Adam Kolker's Quartet (9:40), the David Cook Quintet (10:45) and Owen Howard's Drum Lore (11:50). On Thursday (8/14), the BJU Festival comes home to Shapeshifter Lab, 18 Whitwell Place in Brooklyn where the evening will start with the Tammy Scheffer Sextet (7 p.m.) followed by the Rob Garcia 4 (8:15) and closing with the Brooklyn Jazz Underground Ensemble (the septet) celebrating the release of the new CD. That set commences at 9:30. For more information, go to the BJU website above or click on the Club name. Before "Cat's Dream" entered the house, I knew nothing about its creator, composer/guitarist Rafal Sarnecki. Upon my initial listening, I realized that Mr. Sarnecki is an excellent musician, fine composer and intelligent arranger. He's also a smart bandleader; the native of Warsaw, Poland, has been living in New York City since 2005 and was extremely wise to build his sextet around the rhythm section of Glenn Zaleski (piano), Rick Rosato (bass) and Colin Stranahan (drums). 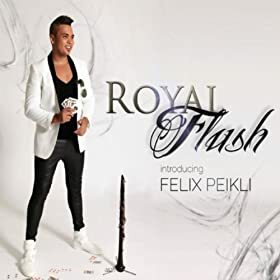 Joining him on the front line is vocalist Bogna Kicinska (also a native of Poland) and reed player Lucas Pino (who appears on Sarnecki's excellent 2010 Fresh Sounds release "The Madman Rambles Again.") That previous recording utilized a trumpet in the front line which is the role of Ms. Kicinska for the new one. There is nary a weak moment on these 8 pieces, songs that display variations in colors and rhythms with well-thought out melodies. One hears the influence of of Chick Corea and John Hollenbeck's writing on the opening track "Three Old Men From The Land of Aran", with its quick shifts in tempo plus the blend of voice with guitar and piano. Stranahan's highly interactive drumming pushes the guitarist and serves up a cymbal washes to support Pino's tenor sax spotlight. Rosato, Zaleski, Stranahan and Pino's bass clarinet build a lovely frame for the voice and guitar on the fine ballad "Piazza Verdi." The bassist gets a solo in the middle of the piece after Sarnecki and Ms Kicinska has presented a long and slowly unfolding melody. Pablo Neruda's poem "Sueno De Gatos" ("Cat's Dream") supplies the album with its title and only song with lyrics. The slippery drums, the full-toned bass and fiery piano give the song its infectious drive, making room for strong solos from the leader and Zaleski. Pino's flute shadows and wraps itself around the vocal in an appealing manner. The oddly titled "Plane Crashes and Conspiracy Theories" has an artful melody as well as furious rhythm for Pino's tenor sax, the rippling guitar and athletic vocal. The rhythm section puts on quite a fireworks show 3 minutes into the 10+ minute piece. There are several short "slowdowns", one before the excellent guitar solo, the other before Pino's tenor takes a ride atop the rampaging drums. The program closes with the longest piece (10:44), "For Anastazja" a multi-sectioned work whose melody sounds as if Sarnecki adapted it from a traditional Polish song After Ms. Kicinska delivers a melody that really shows off her vocal range, the leader digs into his solo over the rumbling rhythm section. Rosato drops into a furious "walking" bass pace for Pino's energetic tenor solo. After the voice, guitar and saxophone re-state the opening theme, the piece slows down for Zaleski's emotionally rich solo. With the bassist and drummer providing a solid foundation, the pianist leads the front line back in to take the song out as it began. 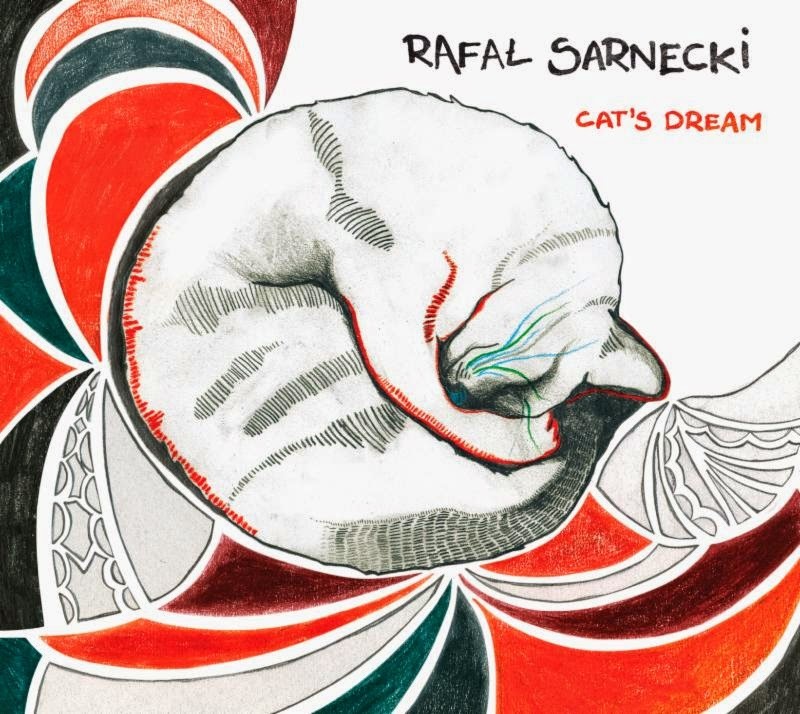 Rafal Sarnecki delivers a major statement on "Cat's Dream"; his music deserves to be heard. There are many fine solos on the recording, many of them building off the impressive melodic and harmonic structures Sarnecki has provided. The super rhythm section, Ms. Kicinska's supple and powerful voice, Lucas Pino's solid work on his different reeds and the guitarist's assertive playing all make this an album worth your time. For more information, go to rafalsarnecki.com/. 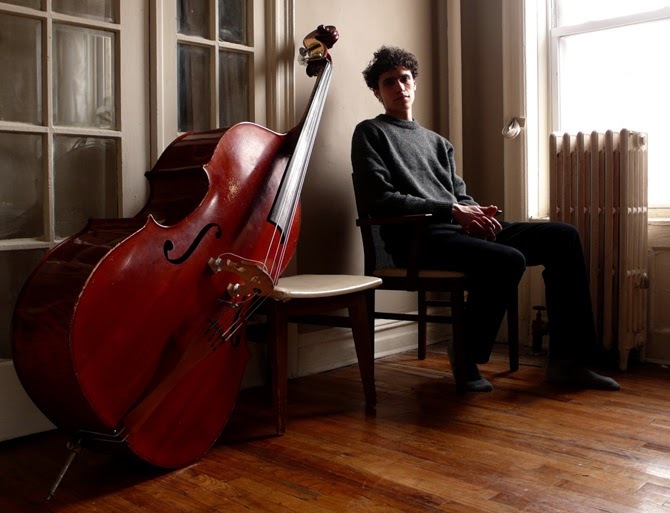 A quick glance at the title of the debut recording by bassist/composer Noah Garabedian and one might expect a classic blues or traditional jazz recital awaits the listener. But, it's "Big Butter and The Eggmen", not "A Big Butter and Egg Man." The lineup that plays this excellent music is a bit unusual - Kenny Warren (trumpet), Kyle Wilson (tenor saxophone), Curtis Macdonald (alto saxophone), Anna Webber (tenor saxophone) and Evan Hughes (drums) - they maneuver through this music with aplomb. Opening with the lovely chorale for reeds and brass, "Gladstone", the Berkeley, CA, native Garabedian gives notice that this will music of surprise and stealth. "Romping" follows (perfect title), a piece that shows the influence of Ornette Coleman and Henry Threadgill, not so much in the execution but in the intent of the composer to give the musicians a different palette of sound and ever-shifting rhythms. A slight return to a variation of the chorale that opened the program opens "Also a Gladstone" - this time, the rhythm section enters to help move the piece and away from its opening mood. Hughes (also a Berkeley native) opens the music up, providing a dancing rhythm track for solos that pair Warren with one of the tenor players After a change in the intensity, Macdonald takes a splendid solo that truly soars without getting lost. "Once We Saw A Blimp" is a bluesy ballad that opens as if it were a classical piece but, soon the various voices start to wander (musically), much like a work by Julius Hemphill. Garabedian's melody lines move away and then back into the center of the piece. The rhythm and melody of "Opposite Field Power" sounds like Kurt Weill meets Xavier Cugat, a Teutonic cha-cha. The leader's unaccompanied bass solo at the start of "Hippie Havoc" (great title) moves from short fragments to thumping rhythm that sets the pace for the drums who falls right into step. Macdonald jumps in next with a solo that twists and turns, ending on a melodic line reminiscent of a Beatles song (that shows up again at the close of the song). When the rest of the group joins in, the intensity picks up for a moment with a militaristic flair before dropping down for a tenor solo. The final track, "Measurements", is a soulful ballad that conjures up music by The Band or a sweet tune from Lester Bowie's Brass Fantasy. There are no solos per se though the melody offers both unison and polyphonic moments. "Big Butter and The Eggmen" is a splendid debut from Noah Garabedian, one that displays his maturity and portends more great music in the future. Because the bass has such a large presence in the mix, one does not really notice the absence of a chordal instrument; yet there is also plenty of space in this music. This is music that does not concerns itself with technical dexterity but is telling stories, communicating with its audience with its soulful qualities. For more information, go to www.noahgarabedian.com. While numerous writers and publications go on about the death of jazz and classical music, artists keep right on creating. The new generation of musicians involved in creative music know they can easily (and usually have to) move in and out of genres, that they can play folk music one night, jazz the next, or work in a Broadway or off-Broadway pit band, all to support their family and their artistic visions. How do they get people to listen? Collectives such as the Brooklyn Jazz Underground, and its record label, offer "strength in numbers", places to play, good career advice and an outlet for their music. These 3 recordings are scheduled to be released August 26 - for more information, go to www.bjurecords.com. 'Tis the weekend of the Litchfield Jazz Festival (go to litchfieldjazzfest.com to check out the fine lineup) but you also have the unique opportunity to see and hear one of the finest improvisers in the United States. 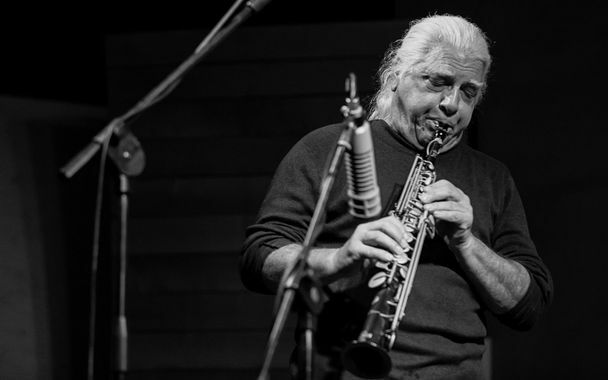 Vinny Golia, born in Fort Apache, the Bronx, New York City in 1946, moved to the Los Angeles, California, in the late 1970s, to perform and to teach. If you look closely at the picture on the left, you'll see him standing amidst a group of saxophones and, chances are very good that he plays each one during a performance. He started the Nine Winds Records label to release his own music and has gone on to document many of the West Coast finest players, composers and conceptualists. People like trumpeter Bobby Bradford, guitarist Nels Cline, clarinetist John Carter, trombonist George Lewis, trumpeter Wadada Leo Smith, and bassist Mark Dresser are among the scores of musicians on the independent label. This Saturday evening at 8 p.m., Vinny Golia (reeds galore) joins Louis Guarino (trumpet), Chris Cretella (guitar) and Adam Matlock (accordion) for an evening of improvisational conversations in the performance space at Never Ending Books, 810 State Street in New Haven. Should be a fascinating concert, full of fire and feistiness. For directions, go to www.neverendingbooks.net. Vocalist and composer Somi , born in Illinois, is the child of parents who hail from Uganda and Rwanda; she considers herself "an East African girl." She has released 4 CDs, the first (now out-of-print) in 2003 and then one each on World Village (2007), ObliqSound (2009) and her live recording on Palmetto (2011). Her list of accomplishments is long and varied, from being at TEDFellow, a Park Avenue Armory Artist-in-Residence, and performing at the United Nations in commemoration of the International Day of Remembrance of the Victims of Slavery and the Transatlantic Slave Trade. In 2011, Somi moved from New York City to the port city of Lagos, Nigeria, currently the 7th largest city in the world. She spent 18 months there, soaking in the culture, trying to make sense of the political scene there but ask throwing herself into producing concerts and intimate salon shows, closing her stay as an Artist-in-Residence at a University in Ilorin, Nigeria, 160+ miles northeast of Lagos. Most of all, her music began to change. She still wrote lyrics concerned with the plight of poor people but also shifted her focus to how women are treated in the Third World to pollution that chokes rivers and water supplies. With help of her top-notch band - Liberty Ellman (guitars), Toru Dodo (piano, keyboards), Michael Olatuja (bass) and Otis Brown III (drums) - plus producers Cobhams Asuquo (Nigeria) and Keith Witty (New York City, who played bass on her live CD) and a slew of guests, Somi has created "The Lagos Music Salon", her debut for the Okeh label. As impressive as her previous recordings are, this CD is a giant step forward. Not only does the music serve as a travelogue for her journeys in Nigeria (the opening track uses the soundtrack of her moving through customs in Lagos), it also is a brilliant meld of traditional and modern rhythms. Think Fela Kuti meets Robert Glasper and you begin to touch the surface. Ellman who works alongside Henry Threadgill and Steve Lehman, plays splendidly throughout, from his "clicking"rhythm guitar on "Lady Revisited" to his strong acoustic guitar on "Four African Women." Michael Olatuja's throbbing bass lines drive the music, making songs such as "Four.One.Nine" (a harrowing tale of a women who sings "You will have to break my arm before you break my heart" to her philandering lover) and "Two-Dollar Day" (a woman looking for any kind of work after the death of her husband) feel like dance pieces (even as the words make you wince or feel sorrow.) He, also, has a powerful solo on "Still Your Girl." 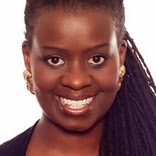 Toru Dodo, who has been with Somi since her 2007 release, is a wonderful accompanist; his support on "Ankara Sundays" complements not only her vocal but also Ellman's guitar lines while his ringing chords and single-note runs on "Last Song" are calming as the percussion pushes the music higher. He may also be responsible for the fine string quartet on 4 of the tracks. The playing of Otis Brown III (Gretchen Parlato, Joe Lovano's Us 5) is exceptional, whether he is blending his jazz/r'nb chops with the other percussion or locking in with Olatuja's funky bass on "Four African Women" - never disruptive, always in good taste, he skillfully frames the vocals and solos. Guests include vocalist Angelique Kidjo, rapper Common, trumpeter Ambrose Akinmusire, the Nigerian vocal group In His Image, and percussionist Ayanda Clarke. Trumpeter Etienne Charles provides the fine horn arrangement on "Akobi: First Born S(U)N" while Alicia Olatuja (the bassist's wife adds her lovely voice to numerous tracks. But, make no mistake, this is Somi's show. She had a hand in composing each song, providing the powerful lyrics. And, her voice is stunning, with a big range. But, it's just that she can hit many notes but there is great emotional depth, ranging from pure joy to righteous anger to mature love. There's no fear, no taking the easy way (the producers surely had a hand in that), no extraneous sounds just to fill up the spectrum - even the string arrangements have power and presence. At 70 minutes, "The Lagos Music Salon" is a powerful musical statement. The energy and the vision never flags, the musicianship is imposing and the sound quality quite impressive. Don't ignore Somi and her music - she has many things to tell you about the condition of the world and does so without preaching or cursing but with love and humility. For more information, go to www.somimusic.com. Since emerging on the Canadian music scene in 2006, the Montreal-based Elizabeth Shepherd has been creating music that skirts the territory between jazz, down-tempo, and r'n'b. While she has no fear of re-arranging standards (her 2012 release, "Rewind", featured pieces like "Prelude To a Kiss", "Sack of Woe" and "Love For Sale"), she is also an impressive composer. The rhythm section of her 5th CD, "The Signal" (self-released/Linus Productions) includes bassist Scott Kemp (5 of the 10 tracks) and drummer Colin Kingsmore (5 tracks), both of whom have played on her previous 4 recordings. She also utilizes bassist Ross MacIntyre (5 tracks), drummer/percussionist Roman Tomé (2 tracks), drummer Larnell Lewis (2 tracks), and drummer Joshua Van Tassel (1 track). Lionel Loueke shows up on the opening track "Willow" playing guitar and adding backing vocals, backing vocals on "Another Day", and percussive guitar on "This." . Ms. Shepherd shares the lead vocals on the title track with Alex Samaras, a member of saxophonist Angela Morris's "Rallidae" (my review here). The impressive Toronto-based trumpeter Kevin Turcotte is featured on 2 tracks, blasting his way through the synthesizer fog and propulsive drumming of Kingsmore on "Lion's Den" and serving as a trumpet choir, funky soloist and the last sounds you hear on "Baby's Steps", the final track of the CD. Ms. Shepherd wrote all the songs, produced or co-produced the album, played Rhodes, acoustic piano, MOOG and sang 95% of the vocals. Several of the songs have samples; the voice of Mother Teresa rises out of the drums on "I Gave", CBC radio host Laurie Brown sets the story of the title track with a tale of synchronicity, and Leadbelly leads off "B.T. Cotton" by introducing a traditional slave song ("jump down, spin around, pick a bale of cotton"). That last track is a sweet, bluesy, funky piece reminiscent of the sound of Gretchen Parlato - the use of the Steel pans, played by Toronto-based, Trinidad born, Mark Mosca, comes out of the blue and is a pleasing addition to the song. Another sample, this time a news report from Los Angeles describing a police action (the announcer mentions "racial profiling", serves as the stepping off point for "Another Day," The lyrics take an abstract view of peoples' actions, leaving the listener with some hope as does the fade on the voices of playing children. One can hear the influence of Robert Glasper's funk-drenched jazz in the excellent Rhodes work of Ms Shepherd. Her experimentation brings to mind the work of Peter Gabriel on "So", "Us", and "Up" with many of the songs featuring her voice multi-tracked. For example, the mix of Larnell Lewis's hard-driving drums, the percussive Rhodes and the numerous voices works to great effect on "On Our Way." Also, like Gabriel, it takes the listener several listens to catch the words. "The Signal" resembles Elizabeth Shepherd's 2010 CD "Heavy Falls The Night", especially in the multi-tracked voices and liberal use of Rhodes. The earlier album has more of an up-tempo feel and a brighter sound while the new one is darker, the sounds a bit murkier or distant but no less attractive. Up until this new CD arrived in the mail on Monday, I had never heard Elizabeth Shepherd. I have a lot of catching up to do and I know it's going to be a lot of fun. For more information, go to elizabethshepherd.com/home/.